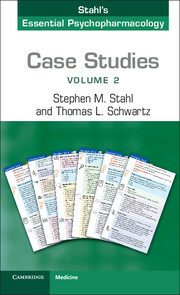 Following the success of the first collection of Stahl's Case Studies, published in 2011, we are pleased to present this completely new selection of clinical stories. Designed with the distinctive user-friendly presentation readers have become accustomed to and making use of icons, questions/answers and tips, these cases address complex issues in an understandable way and with direct relevance to the everyday experience of clinicians. Covering a wide-ranging and representative selection of clinical scenarios, each case is followed through the complete clinical encounter, from start to resolution, acknowledging all the complications, issues, decisions, twists and turns along the way. The book is about living through the treatments that work, the treatments that fail, and the mistakes made along the journey. This is psychiatry in real life - these are the patients from your waiting room - this book will reassure, inform and guide better clinical decision making. 19. The case: anxiety, depression, or prebipolaring? 23-year-old with first depression…that's it! Stephen M. Stahl is Adjunct Professor of Psychiatry at the University of California, San Diego and Honorary Visiting Senior Fellow in Psychiatry at the University of Cambridge, UK. He has conducted various research projects awarded by the National Institute of Mental Health, Veterans Affairs, and the pharmaceutical industry. Author of more than 500 articles and chapters, Dr Stahl is also the author of the bestseller Stahl's Essential Psychopharmacology. Thomas L. Schwartz is Professor and Vice Chair of Psychiatry and Director of Medical Student Psychiatric Training at State University of New York Upstate Medical University. He is an author of Depression: Treatment Strategies and Management, 2nd edition and Integrating Psychotherapy and Psychopharmacology: A Handbook for Clinicians. He teaches nationally and has published numerous articles in peer-reviewed medical journals.